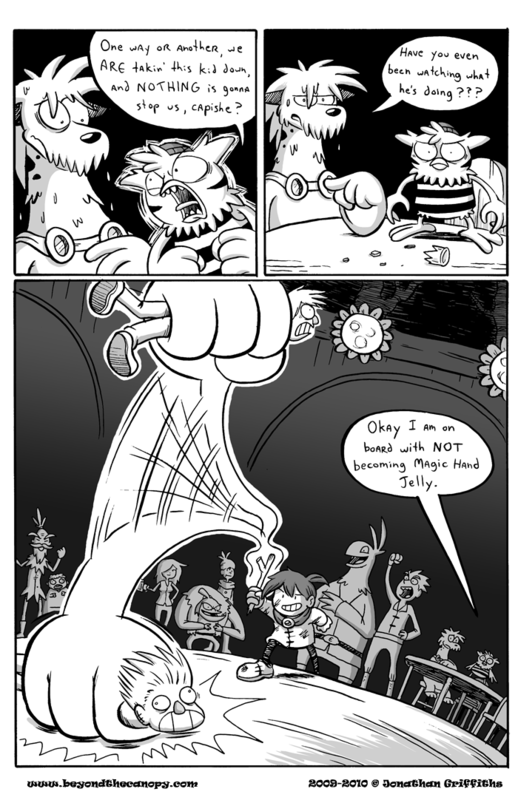 Magic Hand Jelly: Now available in your grocer’s freezer! Wait a minute. If the magic hand transfers force to Glenn’s body (as evidenced by THMK1 being able to grab him by it), shouldn’t he be unable to lift someone using it? So by your logic,he shouldd have flown backwards when he tried to stop Tiny Tin’s fist. It seems to generate a solidified thaumaturgic projection of energy, meaning that it can be used to grab someone but can also be grabbed. TT’s swinging of the fist is due to the fist being flung in a certain direction with a certain purpose and not being done to pull anything, just to stop.